3M announced in 2000 that it was phasing out its popular Scotchgard product, because the anti-stain spray contained chemicals toxic to lab animals. The chemicals had also turned up in the blood of 3M workers, though the company said its employees were not harmed. 3M produced the chemicals at its plant in Cottage Grove, Minnesota. An investigation by Minnesota Public Radio and American RadioWorks found that even after 3M said it would no longer make the toxic chemicals, the Minnesota Pollution Control Agency let two years pass before it began any inquiries. The story raises questions about who is responsible for the safety of the public and the environment, and about whether state agencies are doing enough to protect citizens from toxic chemicals. Until 2000, 3M was the sole manufacturer of the perfluorinated chemicals used in Scotchgard and DuPont's Teflon. Those chemicals stay in the environment, and have contaminated drinking water in at least one Minnesota city. 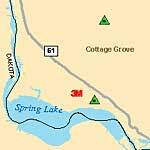 Before there was an MPCA or a Superfund cleanup program, people who lived near 3M's Cottage Grove plant and its nearby landfill in Woodbury had questions about their safety. MPCA: "Not a research agency"
A respected MPCA scientist clashes with her bosses over what the agency should do about perfluoronated chemicals. Much of what is known about perfluorochemicals comes from manufacturers like 3M, which has researched them for years. 3M is facing several lawsuits over contamination. The research into perfluorochemicals is being ramped up, even as thousands of other such substances remain unregulated and unstudied. These chemicals are widespread around the world, found in the U.S. blood supply, the blood of 3M plant workers, as well as fish, birds and animals living far from chemical factories. It's been 50 years since Scotchgard came on the market, and five years since it was removed. In between are many milestones to mark the spread, and study, of perfluorochemicals. See highlights of that history. The 3M plant and the landfills in question are located in Washington County, on the east side of the Twin Cities metro area. See a map of the area. This story came about as a result of two tips picked up by Sasha Aslanian of American RadioWorks. It's a highly charged issue, as she and Mike Edgerly discovered during the course of their reporting. Has the discovery of perfluorochemicals in drinking water in the east metro touched your family? If so, how? Have you changed your water consumption because of the discovery of perfluorochemicals? Various state and federal agencies have collected information about perfluorochemicals. See a list of resources and links.